Memorize the periodic table within minutes! 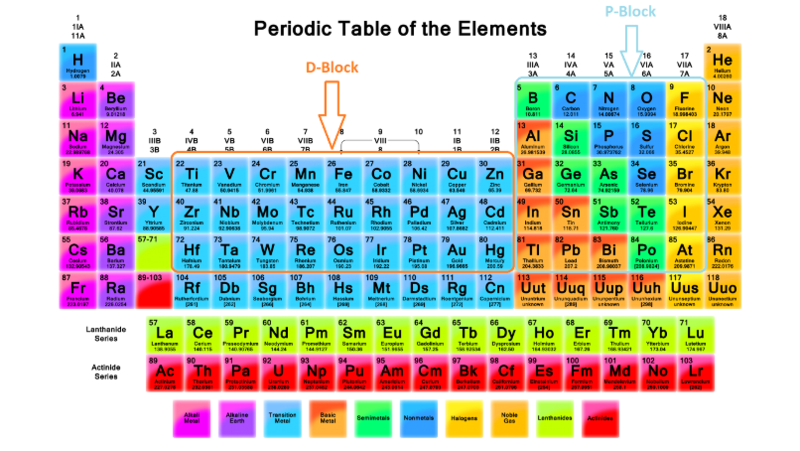 It has always been too tedious to remember the periodic table. Students waste hours on memorizing it but to no avail. Here we come to your rescue. Just remember the first 12 elements (sorry can’t help you in that) and leave rest on us. Just spend a few minutes on going through this matter and you will end up retaining close to 65 elements. We begin with the P-block elements. We shall proceed column wise. Consider the first column. So we are ablout to learn the groups 13-17. Group 13– The group begins with Boron and ends at Thalium. So considering the initials of the elements which are B Al Ga In Tl, remember it as BAGIT or to make it more simpler learn BAG IT. Group 14– The group consists of C, Si, Ge, Sn, Pb. Hence it should be memorized as Carbon and Silicon chips in Germany doped with Tin(Sn) and Lead(Pb). If learnt in this way you are sure not to forget the order. Group 15– The group contains N, P, As, Sb, Bi. Since it begins with N and ends at Bi so learn it as Naga Pambu Aasaiya Saabuduthu Biscuit. Group 16– The elements that come under this group are O S Se Te Po. So it should be retained as Ohh YeS! Se Thu Po. Group 17– The elements counted under this head are Fluorine (F), Chlorine Cl), Bromine (Br), Iodine (I), Astatine (At). Now read it quickly but carefully. They all seem to rhyme as they all end with ‘ine’. Hence it’s simple to learn them this way. Group 18– This group must be learnt by heart as these elements are imperial enough to be present on the periodic table. It’s time to attack the most averted lot of D-block elements. It would be better if we advance in a row wise manner i.e. move according to the periods. Period 4– Pick up the first row of the D-block i.e. the elements with period 4. The elements are ten in number so it is better to learn them in parts. Divide them into two parts. The first one contains Sc, Ti, V, Cr, Mn and the second one includes Fe, Co, Ni, Cu, Zn. Now consider the first part i.e. Sc, Ti, V, Cr, Mn and this should be memorized as Scandium saw Titanic in Vettri Chrompet Theatre with Manganese. It is quite challenging to remember the remaining half. Anyways, the elements included are Fe, Co, Ni, Cu, Zn. Learn it in the way you read the symbols Feh Co Nee Ku Zinc – FeCo NiCu Zn. So memorize that Fe, Co and Ni, Cu are rwo couples while Zn is still a bachelor. But, remember here not to mess the order of Cobalt (Co) and Copper (Cu). Y and Z – two friends – say “Namba Teacher R-square” – and Padi, Aadi to a Cd. Period 6 – First we list the elements covered under this category. They are Hf, Ta, W, Re, Os, Ir, Pt, Au and Hg. Hg – Mercury – Marie – This is a reputed brand of biscuit in India. “Ta – Tantalum – Theriyuma – meaning “do you know”? hey… do not ignore the first element of the periodic table which is also the first element of the Lanthanides– Lanthanum ! « IIT JEE- Chalk out your plan of the last three months!